- Mast Lifts are suitable to move any type of material from one floor to other floors. They can be made in different capacities ranging from 500 kgs to 1500 kgs. We are enagged in manufacturing and supplying of Indef Lifting Tools to our esteemed cleints. We offer to our clients superior range of precision engineered motorized lifting tool and chain pulleys. These robustly constructed chain pulleys are highly durable and meet the industry specifications. 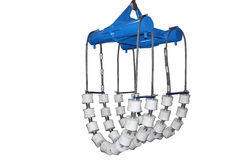 Our chain pulleys are widely used for the purpose of pulling, lifting and lowering. Having a definite quality management system, we are readily engrossed in bringing forth a comprehensive gamut of Metal Piping Support Angle. We hold expertise in offering Lifting Tools. These products manufactured using premium quality raw material and advanced tools at the vendors' end. Our products are known for their attributes like sturdiness and resistance to corrosion. 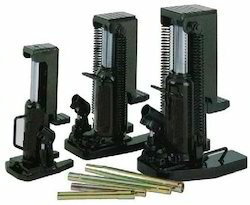 We offer these products in various sizes and dimensions. Lifting Tools for manhole covers are available in various designs and sizes. These lifting keys suit the basic need of lifting light duty, medium duty or heavy duty manhole covers. The lifting keys are designed to fit the keyholes of various sizes of manhole covers. All tools, tackles, machinery, equipment and vehicles are arranged as per job requirements always. Wire Ropes, Hydraulic Jacks, D shackle, Wire Slings, Chain Pulley Blocks, Winches, Polypropylene & Manila Rope, Polyester Slings & Ratchet Slings.